Welcome to Dino Week! This week my blog post will be all about kid friendly activities about dinosaurs! Yesterday we made Dinosaur Fossil Cookies and today we’re going on a Dinosaur Safari. So grab your safari gear and let’s go! The first thing we did to prepare for our safari was to make safari binoculars a few days ahead of time. I set this up as a painting activity and didn’t tell my son exactly what we were making. So, the safari would remain a surprise for a few days, giving the paint plenty of time to dry! 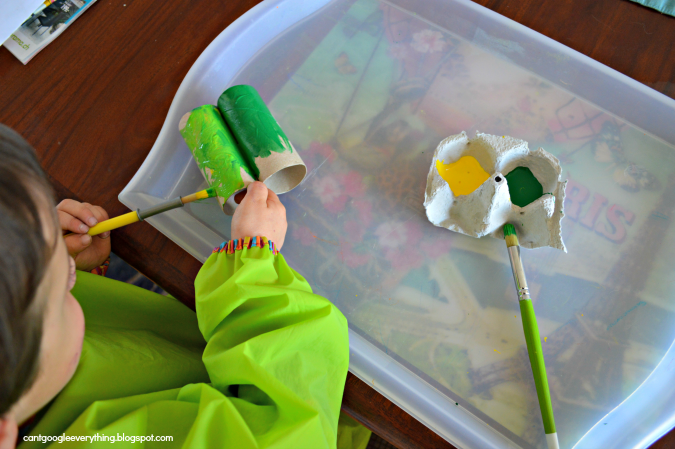 For these DIY safari binoculars simply staple together two empty TP rolls and let your kid paint away! After the paint dries, add a ribbon so they can hang the binoculars around their neck for the safari. We’ve had a lot of rainy weather this week but thankfully there was a little sunshine on Saturday so we could do this activity! I hid little plastic dinosaurs in the plants near the sidewalk for the safari and then called my husband to bring my son down. 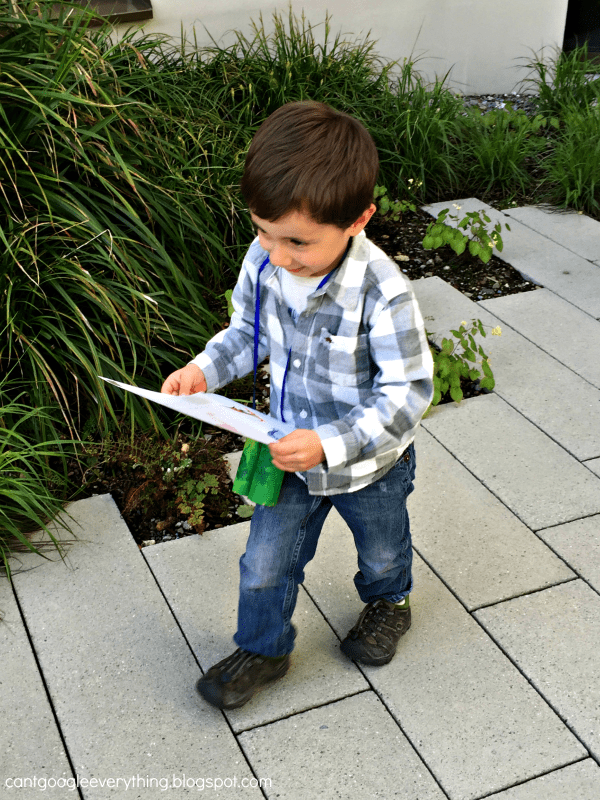 He came equipped with his safari binoculars and safari checklist printable so he knew what color dinos to look for! He was super excited and kept talking about finding all the dinosaurs. 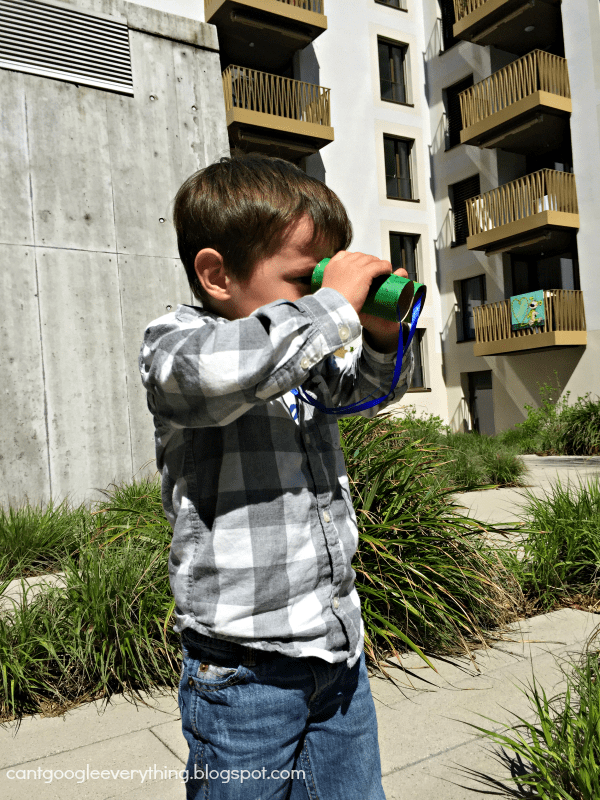 He used his binoculars to look and would even pause to listen, claiming he heard “dinosaur noises,” which we played along with! He found some of the dinos quickly and took a little more time with the others, but found them all with only a little tiny bit of guidance. I can definitely see this as an activity he will want to do again! 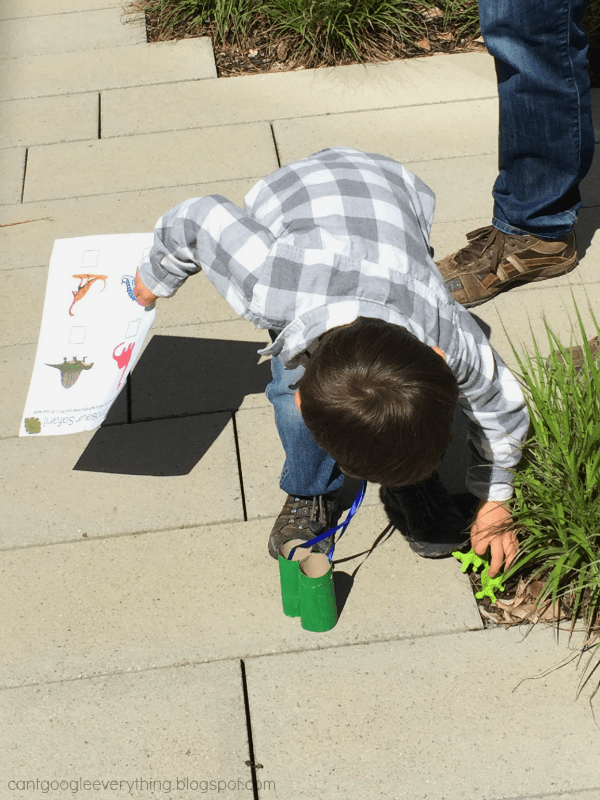 This activity was a fun way to get outside, learn some dinosaur names and help him remember his colors. You can do this easily in any size backyard (you can see we live in apartments and our “yard” is really just a shared garden) or take it out in the woods for an extra challenge! If you want to join the fun, grab the free printable below and set up a dinosaur safari of your own! Click picture for free printable! So what do you think? Will you try a backyard dino safari? So cute! I love it. I wish my kids were super small again so we could do this.